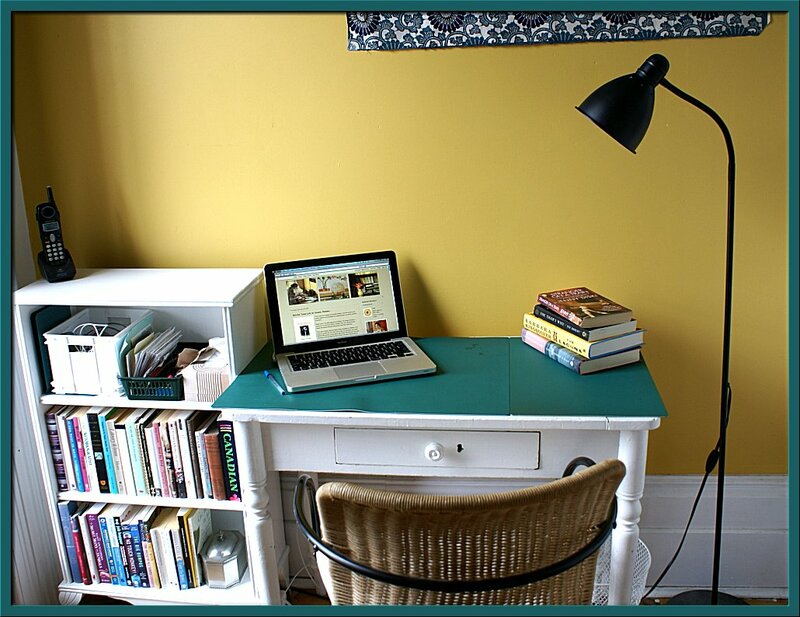 Scene of the Blog Featuring Trish of Desktop Retreat! 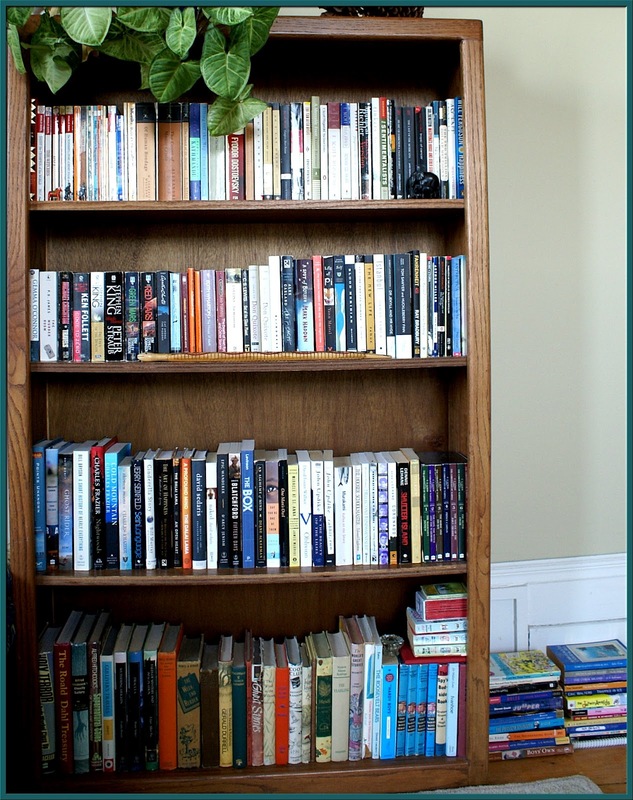 I discovered this week's featured blogger through Alyce's meme Saturday Snapshot on her blog At Home With Books. When I visited Trish's blog, Desktop Retreat, it made me smile. Her blog header immediately tells you that this is a woman who loves both books and art. You'll find the usual review posts, but you'll also find quotes from her reading, lovely works of art, photographs of bookshelves that she admires.... Desktop Retreat is a virtual visual feast, and if you haven't visited, I hope you take this opportunity to do so! If you're visiting from Trish's blog-- Welcome! I'm glad you came over to take a look at Trish's creative spaces. If you'd like to see any of the photos in larger sizes, all you have to do is click on them and they'll open in new windows. If-- after enjoying Trish's spaces-- you'd like to take a look at previous participants, click on the Scene of the Blog tab at the very top of my blog header. You'll find two ways to search: by Blog Name or by Location. Now let's take a look at where Trish reads and blogs! I live in Canada on the shores of beautiful Lake Ontario near Toronto with my husband and youngest of three sons. I've always enjoyed reading but have found it increasingly difficult to keep track of all the books I've read once I'm done. I started this blog about four years ago mostly as a way to record my thoughts on books as well as a place to collect all the book/reading themed pictures and quotes I enjoy so much. I thought about writing it all down in a journal but then decided an online journal would open up the possibility of discussions. And, really, it has opened up so much more. I have discovered books and authors I might never have noticed before all because of other bloggers' comments, reviews, and recommendations. I didn't realize how narrow my reading had been before I started sharing book thoughts online. It's amazing how many other bloggers are out there with such contagious bookish enthusiasm! My book reviews are conversational rather than a formal parsing of plots, characters and story lines. I speak mostly to how a book made me feel, or what a book made me think about because, over the years, that is what I remember most about what I've read. If there are details I want to remember, or quotes, then I will certainly make note of those too. I have no set rules for my reviews: sometimes they're long and sometimes they're just a few thoughts along with the summary from the back cover. I've thought of applying a five-star rating as well, but I'm not sure if I will. 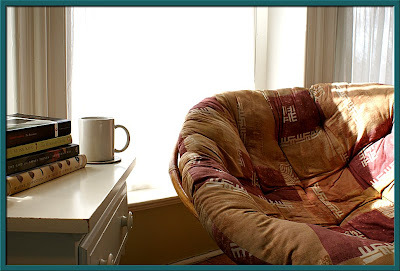 I like to keep my blog informal, uncluttered, and comfortable as if it were an extension of my own reading and writing space, quiet and inviting, like the kind of place I would love to retreat to with lots of cushions, bright windows and bookshelves. I was thrilled to discover Shelfari had these shelf widgets for my sidebar. What's on my blog's virtual shelves is exactly what's on my actual shelves. We live in an old house with a tiny room over the front door called a 'sewing room'. I don't do much sewing but I think in Victorian times ladies would retire to this small space to take care of all their needle work. Nowadays, though, it is my office, my retreat. I like simple spaces so this suits me just fine. The desk and bookshelf are from my childhood home -with a few coats of new paint over the years, and a green desk-protector/writing pad for the top. The books next to my laptop are waiting to be reviewed and re-shelved. The books in the little shelf next to my desk are my writing and reference books, dictionaries and whatnot, and books I am reluctant to part with. The perfect spot to read! ...right next to my little office, a bright and cozy place with a most comfortable papasan chair - perfect for reading! I've had this chair for about fifteen years so it's getting very creaky and is probably due for a replacement soon. I was thinking to get myself a *real* chair this time, with loads of stuffing and enough room to curl up. The books on the side table are my newest acquisitions waiting for a more thorough inspection. I'm fortunate to live near a library and a couple of very busy and inexpensive used-book shops where I can almost always find a few Must Reads every week for a handful of change or book trade-ins. It's a fantastic system that along with a bit of strategic sorting, donating, and passing on keeps my own shelves from overflowing. It also helps that my two university sons have taken most of their books with them freeing up more shelf space for me. I love the natural light in your little office, Trish, and that papasan chair! 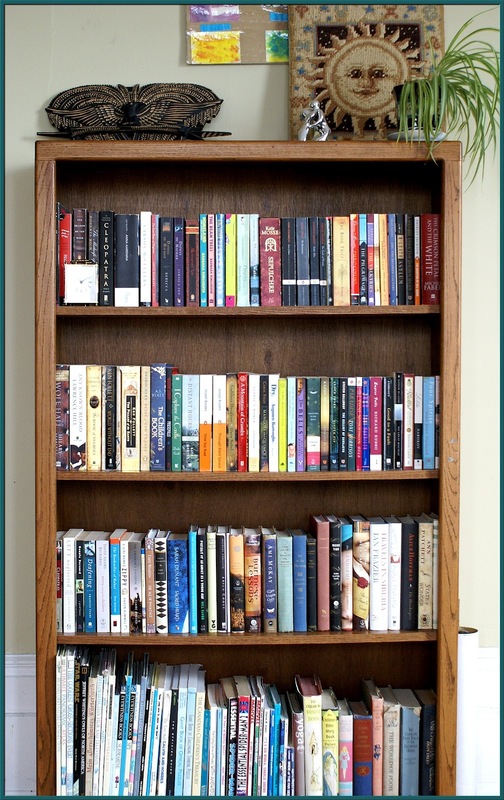 There's such a wide range of books on your shelves-- from the Hardy Boys to Fahrenheit 451. I couldn't help but notice the needlepoint sun atop the large bookcase, and what is that object to the left of it? You've repurposed a Victorian sewing room beautifully! Thank you so much for allowing us this glimpse into your home and your creative spaces. We certainly appreciate it! Thanks, Cathy, for your wonderful post! Yes, the objects on top of my bookshelf are special to me and I can see them whenever I sit down to read. The needlepoint sun is something my mother made for me: I love celestial images and she loves doing needlepoint, so . . . The wooden carving is from friends of my in laws who went to New Guinea. The poster on the wall just behind the sun is something my youngest son made in art class last year. And the little metal sculpture is of a mother and child given to me by a friend. Thanks for noticing those! I see them every day and didn't think to add them to my post. Thanks so much for letting us know about them, Trish! I'm green with envy at the neatness of Trish's reading and writing spaces. I'm hopeless at organization so my desk is currently (and usually) drowning in piles of paper and books. Oh to be tidy like Trish. Thanks for sharing. Thanks, Sam! I do love my little desk . . . Loved this! I find it interesting that the look of our blogs mirrors the look of our homes. We are all individuals and our blogs reflect that. I couldn't see all the titles, but I so loved looking at the shelves. Thanks, Nan! Yes, I was aiming for a virtual extension of an actual place I love to be in. I discovered Trish's beautiful blog only a short time ago and have already pinned several of her images to my Pinterest boards (with full credit). Trish - your blog is gorgeous, and I'm glad to get to know you a bit better through Scene of the Blog! Thanks for your kind words, Debbie. I'm always happy to know people are enjoying and sharing the images I post. Thanks to Trish for the peek into her space. 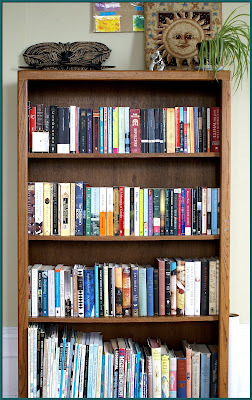 I'm glad to see I'm not the only one that puts bookshelves in the guest room! Ha! Yes, my guests have come to appreciate my little collection. I do so much love to share books and it's always fun to discuss them when we visit each other again. Count me as another host with shelves and books in the guest room! Oh, for a neat work space ... I am due to clean up my little room, but the gardens call and the back porch is much more inviting at this time of year ... maybe, though, on the next rainy day. Trish's space is an inspiration! Now when I make a remark about waiting to do something on the next rainy day... that could be months away!